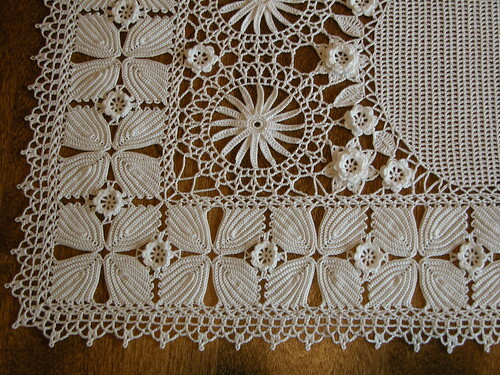 I love to make thread crochet table mats, such as doilies and runners. This is a close up of a corner of a rectangular mat. I don’t know what else to call it. It has 104 palm frond leaves. I had about a third of them done when I figured out a smoother way to start, so of course I made all new ones. There are lots of nice things to make in this design (the whole mat can be seen on my flickr page 1). I found the big daisies’ petals interesting since they are done in two layers. I also liked the little leaves made with stitches of different heights. The pieces didn’t fit as written in the pattern, so I had to baste everything to a cloth and make chains to hold everything in place. The border was also not part of the pattern. The leaves curled up and twisted so I added a border like the one on the inside of the leaves. It is a crisscrossing double crochet stitch. Then to that I added an edging that has picots. I was thinking of it as a fence around the garden. It is made with size 30 DMC Cebeila white thread and a size 12 steel hook. I think it works nicely as a table center, since it acts like a floral frame around a vase of flowers. This entry was posted on Thursday, November 13th, 2008 at 3:00 am and is filed under Crochet and Lace. Tagged: Crochet, Doily, Lace, Thread. You can feed this entry. You can leave a response, or trackback from your own site.